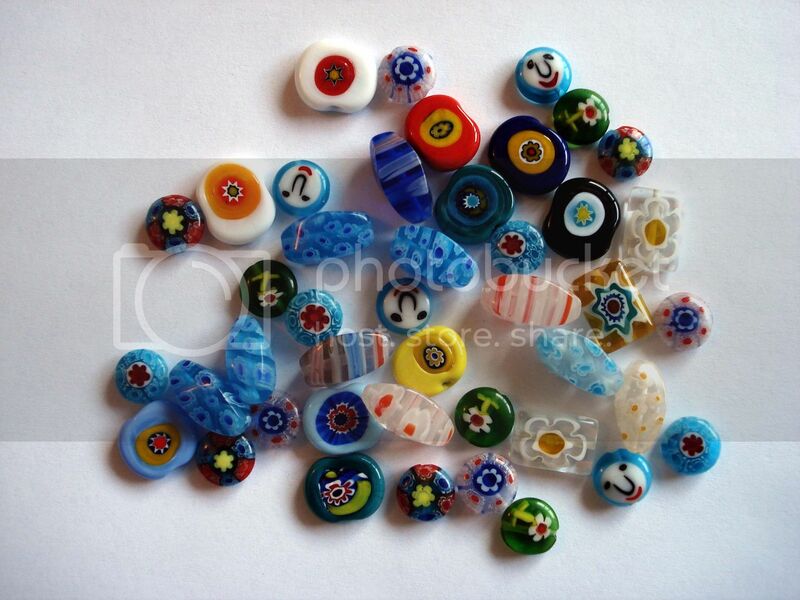 Before I went to Venice & the island of Murano, I was warned that real Murano glass beads are hard to find. I also read that many shops were selling imported beads from China which were labeled as Venetian or Murano-style glass beads. But, I wanted to go see for myself. After about a day or so, I located a bead shop which was not far from my hotel on the main island of Venice. The above shop, Perle e Dintorni, is not far from Campo San Stefano. 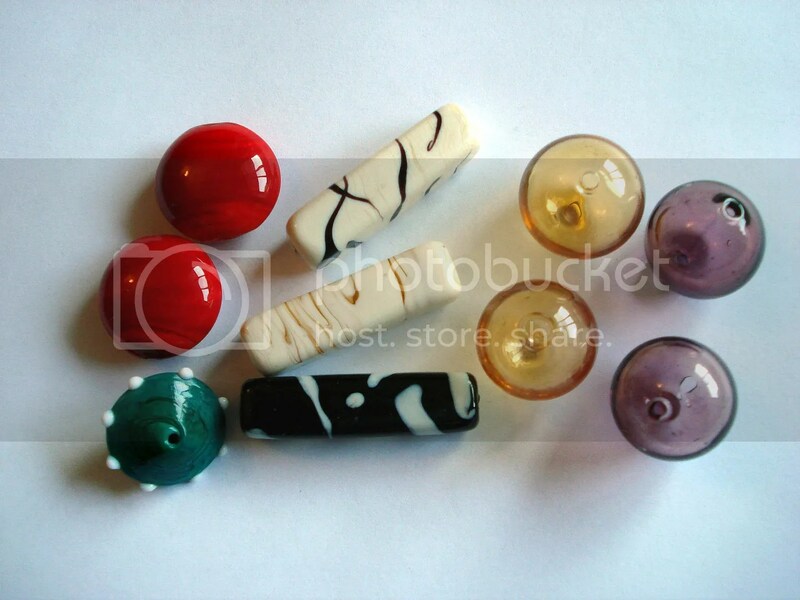 I spoke with the store clerk who pointed out which beads were Murano glass and which beads weren’t. Beads in jars along the back of the store were Venetian or Murano glass, and strands in the windows came from Czech Republic, France, Germany, or Africa. Materials included glass, paper, stone, or wood. 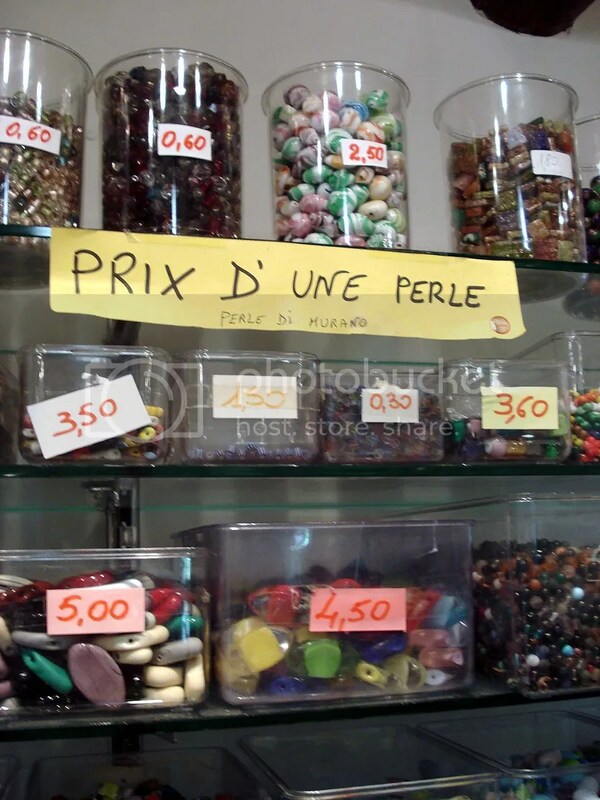 Most prices were per bead, but there was also a mixed selection of beads which were sold by weight. This shop was lovely. I bought a few beads there, but I really wanted to wait until I went to Murano. Bead shopping on Murano was tough at first. 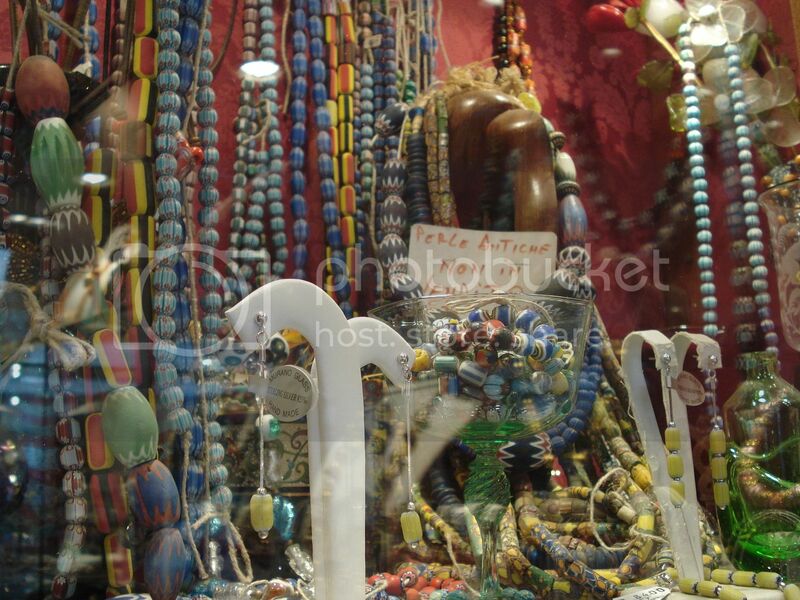 Most shops on the island only sell artist-made Murano glass beaded jewelry, but I wanted to find loose beads! I asked around on the island, but I found it best to just look in every shop. 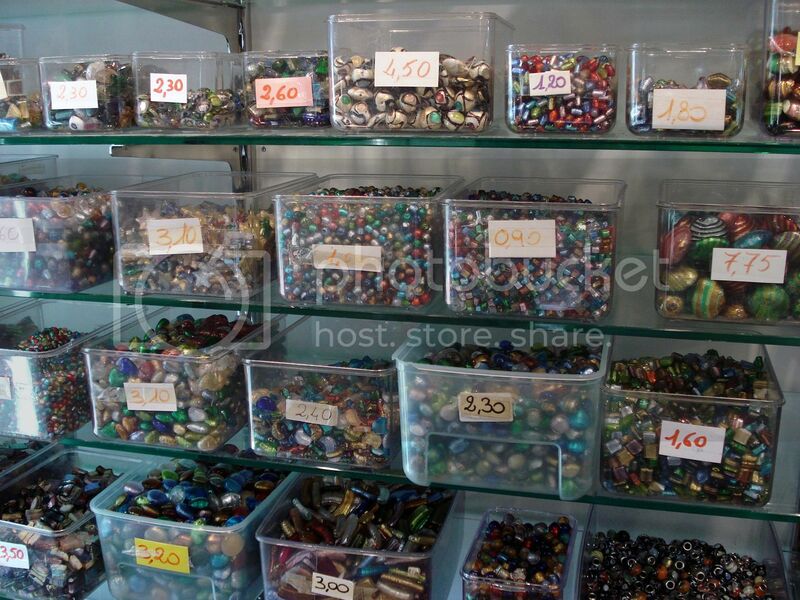 I quickly learned that many jewelry shops also had a drawer or two filled with loose pendants & beads. Many of these shops also had signs up which stated that they did not sell Chinese beads. 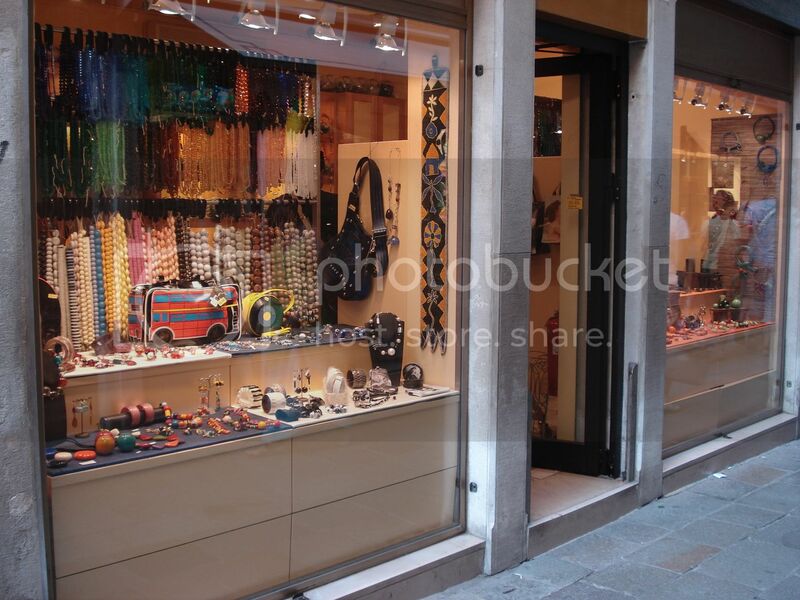 Then, finally, just around the corner from the Glass Museum, I found a shop which was lined from top to bottom with containers full of Murano glass beads! 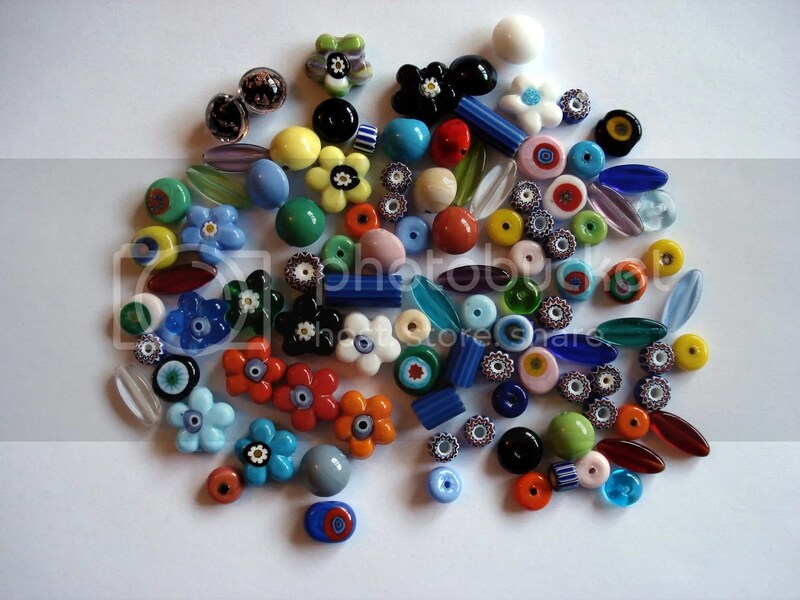 Large & small, beads are priced per piece. 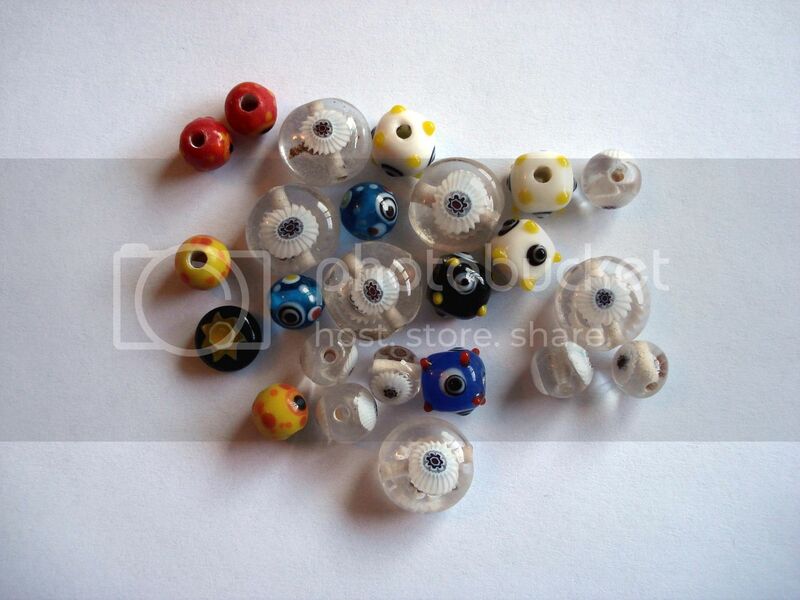 Given the exchange rate, many of these beads are quite expensive, but they are genuinely beautiful. Here, I marveled at all of the large beads, but I bought mostly small ones that I could use in my bead embroidery projects. Do you remember the name of the shop on Murano. 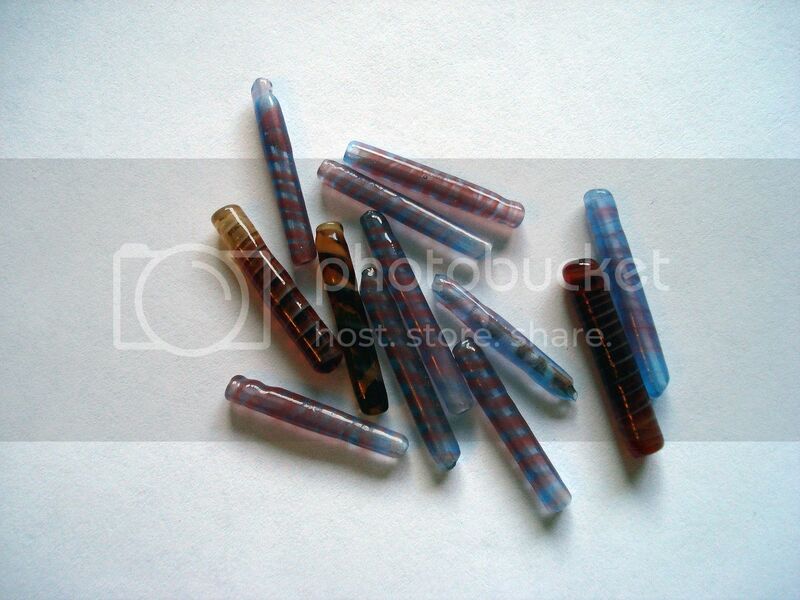 Hi Bobby, I am a Malaysian who has just taken up collecting glass beads as a hobby. I would be pleased if you could possibly give me the addresses of the good bead shops you have visited in Venice. I am planning to go bead hunting in Venice next year. Very many thanks. >I will no doubt keep in touch!!! Let me know if you are interested in some pictures of the showcase. I will be glad to send them to you. >Hello Francesca! Thank you for the invite! Unfortunately I am not planning to be in Venice this month. I would love to participate in your show, but cannot afford to come at last minute's notice. 😦 I would like to return to Venice perhaps next year either for Carnevale or the Biennale! Please keep in touch when you can! Grazie, Ciao! >As I promised you… on May 26, at 4.30 pm, in Venice – Italy, "DO YOU BEAD – VENEZIA JEWELRY SHOWCASE – STOPPING TIME" will take place! Please let me know (because the event is just under invitation) if you will be in Venice and if you are interested in participating to the show. Hope to see you soon! >Thanks for looking my websites! Next year, at the end of May or early June (I will shortly publish the right date on the doyoubead.com website) there will be in Venice the 2nd edition of Venezia Jewelry Showcase. Why don't you join us? See you soon. >Probably you didn't visit my shop!!! If you are looking for loose vintage or antique genuine venetian beads please feel free to visit http://www.operavenezia.com and http://www.doyoubead.com and to keep in touch with me. 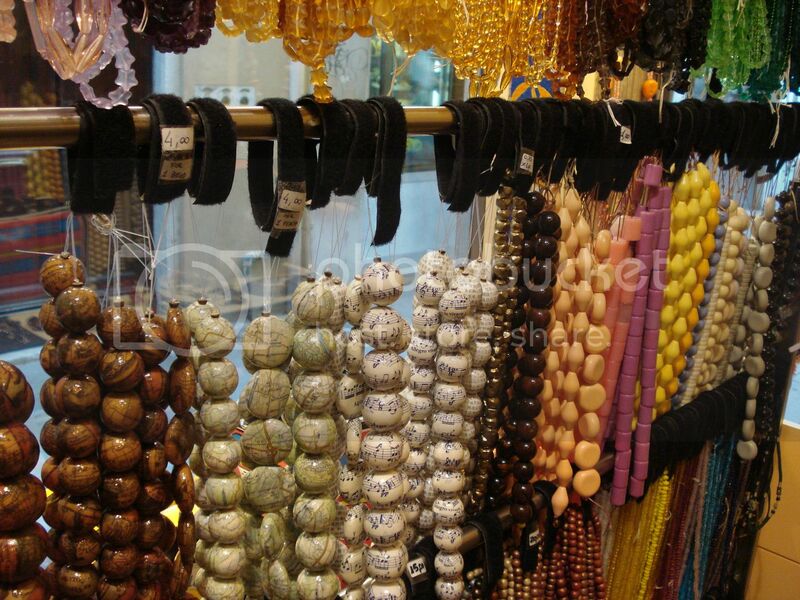 >I think searching for specific beads in a foreign country probably is a great way to wander in a city. I quilt, and have searched out fabric stores in Asia and Europe, (and North American) and have had some fun memories related specifically to these treasure hunts. >I bet you were in heaven LB! >Drooling here in Ohio. 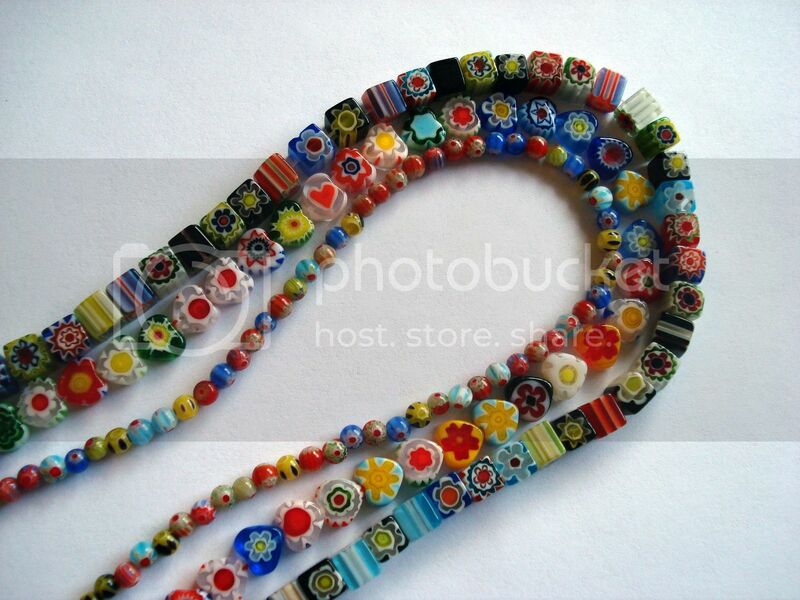 . .
>Oh my goodness, what gorgeous beads! I'm drooling over the pictures- I can't even imagine how beautiful they are in person. 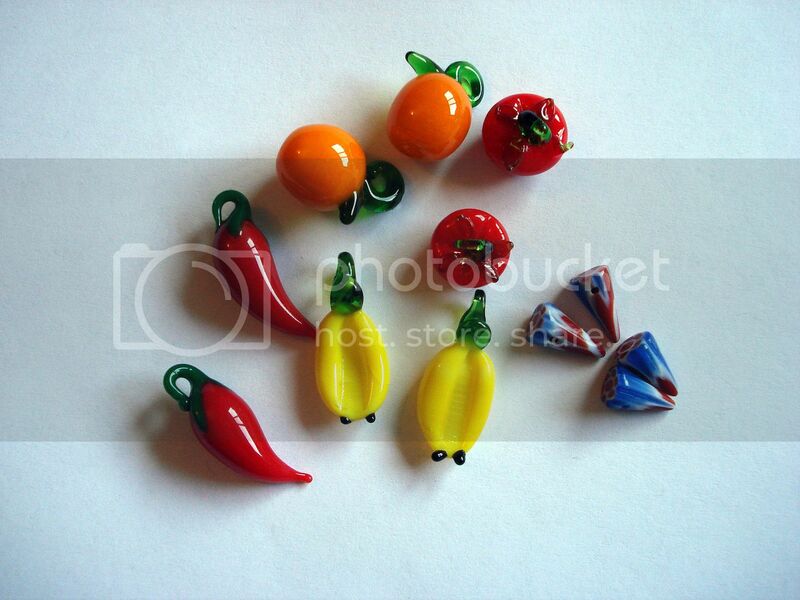 >Great pictures, I love the little fruit and vegetable ones. Murano glass so beautiful. >I am totally envious of your opportunity to visit Venice and Murano Island! Great selection although I know I would have been in agony seeing all those beautiful expensive pieces and not buy them! >WOW, lots of nice little beauties…I MUST go there, wow…. must….. very interesting blog posts you make now. – But as you ask, I recognize a few from our last trip to Czech Republic. >What fun to see these! My faves are the little cone-shaped ones (2 pairs) and the long, tubular ones in the pictures that followed. My husband wants to know why I always have to choose favorites and point them out… I dunno… just do! >The beads you chose – and saw – are gorgeeous! I loved reading about your searches in the stores! What a wonderful trip!